As a child who lived in Africa, I used to see ants move in a straight line, with each carrying a crumb of food. I always wondered how possible it was for insects with less developed brains to act in such orderly manner. Many a time, I would stand and watch them for a long time. Sometimes, I even tried distorting their movements. For a while, they would disconnect, but after a few minutes, they would find their routes back, and continue with their unique orderly movement. As I grew up, that thought of this special creature never left my mind. My curiosity drove me into finding out the science behind this unusual singleness of purpose. So, I searched and read until it came to my awareness why ants move in a straight line. Not only did I find out the chemistry behind this exclusiveness but also went ahead to ponder on its implication and lessons that humans must learn from this genius of a species. When ants want to gather food, each, from their colony goes in search of its source. Inside the body of ants is a chemical called pheromones. Pheromones are like scents with a strong smell. So, as ants disperse from their habitat in search of food, each will leave a trail of pheromones along its route. On returning, they follow the smell of the trail back to their habitat. The trail of pheromones is what takes them back to their origin of start. As a result, no ant strays. Any ant that goes for food but finds nothing, comes back home to see if fellow colleagues have been successful. If they have, they join in gathering food from that source. The interesting bit is this: more than one ant may find different sources of food. If an ant finds a source of food, it picks a crumb, and comes back home. As it goes back to that source, it leaves additional pheromones, picks another crumb, and comes back to base. As it goes again to the source of food, it leaves another trail of pheromones. The summary is that anytime it goes to its source of food, it keeps leaving pheromones. These additional pheromones make the smell stronger. For the guys who didn’t find food, the smell of their trails gets weaker. Instead of continuing on a weak trail, they join a strong-smell trail because it is an indication that there is food at its end. As they join this trail, they also leave more pheromones on their way to the source of food, thereby making the smell more strong. One after the other, ants who found no food come back to the habitat, smell the strong trail, and join the rank. But there are situations where more than one ant finds different sources of food. These different destinations have different distances. How it works out is that the trail of the ant with the shortest distance smells stronger than that of the others. Because of the frequency of bringing food back home, more pheromones are left on its trail as it revisits the source of food. When other ants who found other sources of food come back home and smell the strongest trail, they abandon their own trails and follow the one with the shortest distance. On the long run, all the ants in that habitat join the strongest trail and move in a straight line. What are the lessons to learn from this unusual combination of nature, chemistry and behaviorism for a team? Many times, what we call a team isn’t actually one because everyone begins with its own thing and ends with its own thing. At the end of the day, there is no direction and no purpose. One major lesson I have learnt from the ants is the singleness of purpose. Everyone in the colony identifies a need; food – works towards that need with one heart, one soul and one destiny. And achieves one result; plenty food. No one in the ant’s habitat strays because they are all focused on one thing. As a result of the focus, each channels all its resources towards achieving that goal. They push towards the goal until they make it happen. At the end, no individual takes credit for a collective effort put towards making the vision real. Seriously speaking, the ants are wiser than most human teams. Another lesson is the question of ego-centrism. Most men (I mean mankind which includes women), when they find a source of solution, prefer to stick to their discovery even if another person’s is cheaper to achieve. Because of their ego, they won’t abandon their long distance and herculean approach to follow a more subtle, easier and less expensive, but far-more-result oriented method. The ants, in spite of discovering a source of food, are willing to forgo their ideologies to follow another trail that is less stressful. Man stresses himself, and puts his team in an untold hardship because of his ego! It will be injustice to conclude this write up without addressing the sense of smell. The ants leave a trail, and are able, on their way home to smell the scent that will guide them back to their habitat. Many people can’t smell what should keep them on track; so they stray. They may be in a team, but are in the real sense not in the team because they have wandered away from the precepts that put it together. Because they have lost their sense of smell, they are alone. And because of their self inflicted isolation, they become victims to predators. Learn from the ants you sluggard! 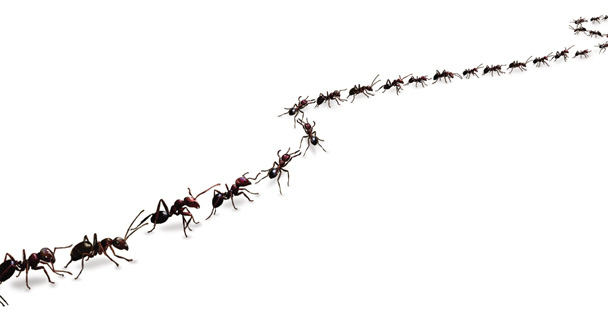 lessons for team playersteamwhy do ants move in a straight line?